Opportunities, Inc WI – Manufacturing Services, Training and Employment - Opportunities, Inc.
For open professional positions, visit our DPSpro career portal. Opportunities, Inc. has unique employment opportunities for people with disabilities. Special consideration given to candidates with a documented disability. 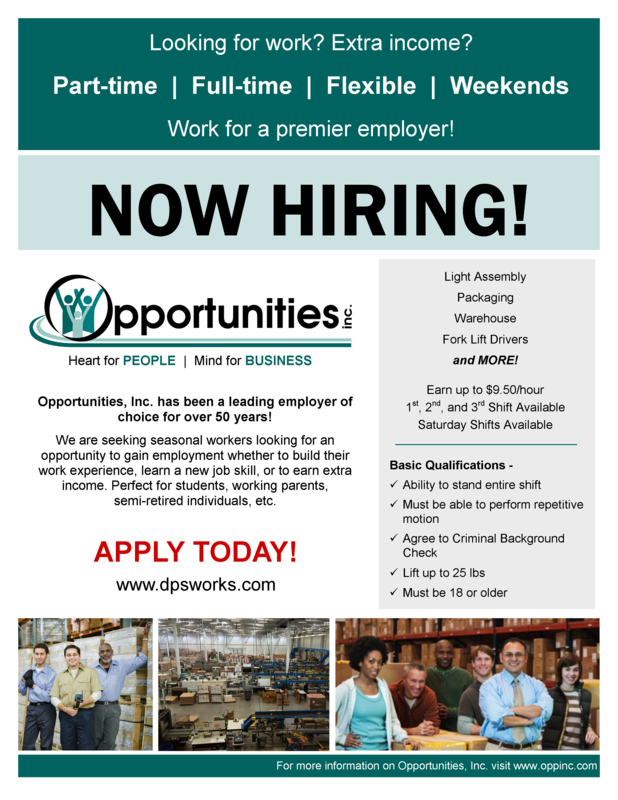 Opportunities, Inc. is a one-of-a-kind employer of choice seeking great people for multiple light assembly and packaging positions available on all shifts. Enjoy our friendly work environment, clean state-of-the-art facility and equipment! Wages range from $7.25 up to $9.50/hour with great benefits and pay incentives. As a Packaging & Assembly Support Worker, you will be responsible for accurately assembling/packaging product and materials per customer specs. Si habla espanol! Opportunities, Inc. Social Services provide individuals with diverse abilities the options to maximize their independence and engagement within the community. As a Skills Trainer, you will be responsible for directly engaging, training, and mentoring participants in a variety of settings as defined by the participants' plan and/or assignment. 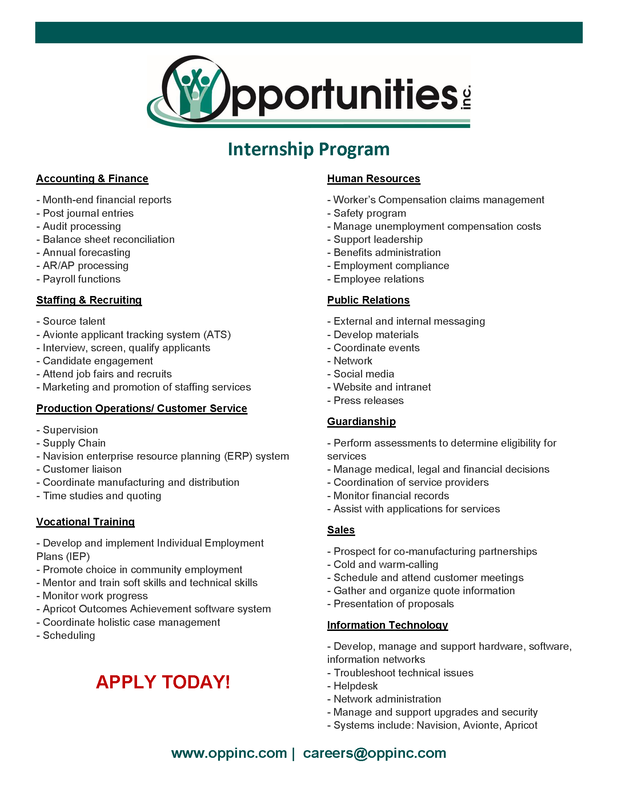 Opportunities, Inc. Internship Program (OIIP) offers comprehensive career exploration within the agency's many different programs and business sectors to eligible students, recent graduates and others on a continuing education pathway. The OIIP enables you to use your education and expand your knowledge,as well as serve in the mission to advance people! The OIIP is a great way to explore the vast career choices in your future! Contact us to learn about current interships available.